So close and yet so far. That was a familiar feeling for the Dodgers, as they had lost a close race in 1950, falling just two games behind and then battled down to the last day before losing the N.L. 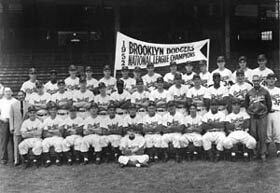 Pennant in a playoff series to the New York Giants in 1951. However, in 1952, behind the fine pitching of N.L. Rookie of the Year Joe Black, who was 15-4 with 15 saves and a 2.15 ERA, the Dodgers captured the N.L. Pennant by 4 1/2 games over the Giants. 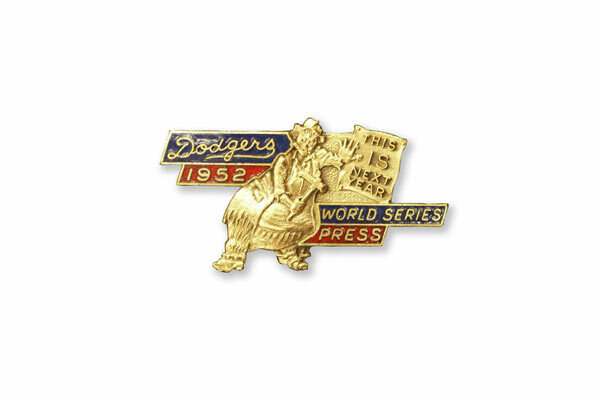 Once again, the Dodgers reached the World Series and were matched up against the New York Yankees, who won 95 games that season. First baseman Gil Hodges hit .254 on the season but had 32 roundtrippers and 102 RBI. Duke Snider batted .303 with 21 home runs and 92 RBI. Carl Erskine was 14-6 with 2 saves and a 2.70 ERA. Erskine no-hit the Chicago Cubs, 5-0, on June 19. On May 21, the Dodgers set a modern-day National League record as 19 straight batters reached base against the Reds in the first inning. The Dodgers’ impressive opening act resulted in a modern-day N.L. record 15 runs scored in the wild inning. The Dodgers made their first World Series appearance since 1949, once again facing the Yankees. In Game 1, Black was the first African-American to start and win a World Series game, 4-2, at Ebbets Field. Snider’s two-run home run in the sixth inning, put the Dodgers ahead, 3-2. It was the first of Snider’s four home runs in the Series. Black would also start Games 4 and 7. The Dodgers lost Game 2, 7-1, as Mickey Mantle’s four RBI paced the Yankees. Brooklyn got three hits in the game, all in the third inning when it scored its only run. The Dodgers won Game 3 at Yankee Stadium, 5-3 as Billy Loes got the win and Yogi Berra’s passed ball got two runs home in the ninth. In Game 4, New York won 2-0, on Allie Reynolds’ four-hit shutout. But the Dodgers and Erskine won Game 5, 6-5 in 11 innings. Erskine surrendered five runs in the fifth inning, but held the Yankees at bay for the rest of the game, retiring the final 19 batters he faced. Snider, who homered in the fifth inning with one on, singled in the winning run in the 11th inning. The Yankees evened the Series in Brooklyn in Game 6, beating the Dodgers, 3-2. Mantle’s home run in the eighth put the Yankees ahead, 3-1. Snider hit two solo home runs in the game off Vic Raschi. In the finale, the visiting Yankees scored single runs in the fourth, fifth, sixth and seventh innings to win 4-2. Mantle’s home run in the sixth put them ahead 3-2 and made a winner of Reynolds, who came in to pitch in the fourth inning. Snider and shortstop Pee Wee Reese each had collected 10 hits for the Dodgers during the Series, matching Mantle’s 10. 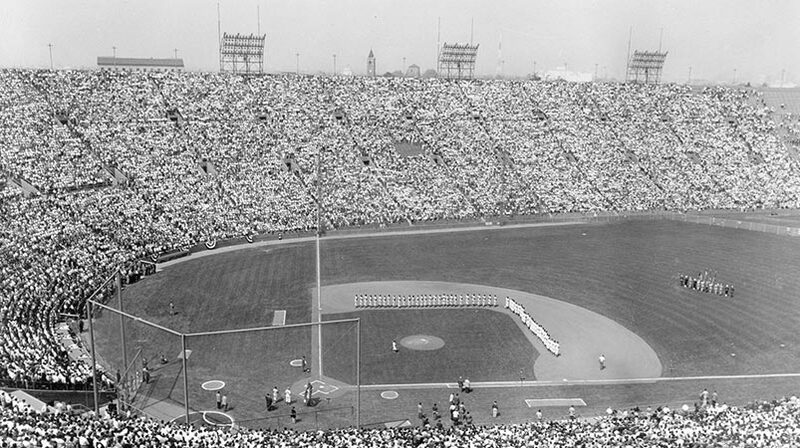 The disappointed loss in Game 7 on their home turf before 33,195 fans meant the Dodgers would once again have to wait ‘til next year. 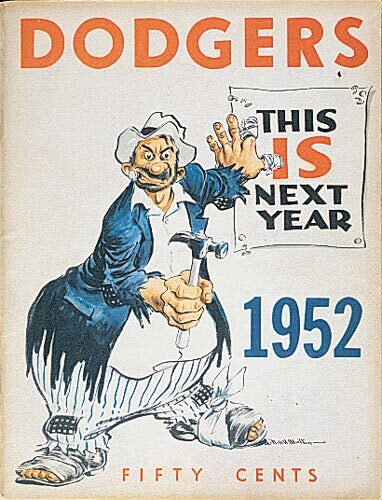 Click image for a larger view1952 Dodger YearbookCopyright © Los Angeles Dodgers, Inc.
Click image for a larger view1952 DodgersCopyright © Los Angeles Dodgers, Inc.